Wilfred Vernon Matthews, was born in Abergavenny, Monmouthshire in 1895. He was the son of insurance superintendent, later Mayor of Yeovil, Jabez Matthews and Martha Dixon née Taylor. By the time of the 1901 census Jabez and Martha had moved to Yeovil and were living at 190 Sherborne Road with their children: Winifred (b 1885), Percy T (b 1886), Harold E (b 1887), Gladys (b 1893), Wilfred (b 1895), Donald (b 1897) and a female servant. Jabez gave his occupation as 'Superintendent of Insurance Agents, Prudential Assurance Co'. By the time of the 1911 census the family had moved to 36 The Avenue and 16-year old Wilfred was listed as a scholar. In the spring of 1917, at Dartford, Kent, Wilfred married Louisa J Bicknell. Wilfred enlisted in the Army during March 1916 and became a Private in the Dorsetshire Regiment. He was later transferred to the Wiltshire Regiment, promoted to the rank of Corporal and sent to France. According to later reports in the Western Gazette, Wilfred "participated in some very severe fighting but came through unscathed. He conducted himself so well in the ranks as to win the notice of his officers, and he was taken out of the trenches and sent home for training for a commission. After undergoing the usual training he was gazetted as Second Lieutenant in the Border Regiment and returned to France." On 1 October 1918 Lieutenant Wilfred Matthews was killed in the heavy attacks on the Hindenburg Line. 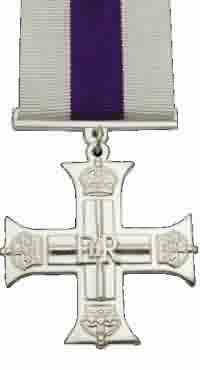 Wilfred was leading his platoon in an attack, when he was instantaneously killed by a machine gun bullet. He was aged just 23. The Western Gazette, in its edition of 11 October 1918, reported "Second Lieutenant Wilfred V Matthews of the Border Regiment, son of Alderman and Mrs Matthews, of The Avenue, was killed in action in France on October 1st. Official news to the effect, together with a message of sympathy from the Army Council, was received by Mr and Mrs Matthews on Tuesday morning. The deceased officer joined up in March 1916, and was attached to the Dorsets, being subsequently transferred to the Wiltshires and promoted corporal. He went to France about two years ago, and participated in some very severe fighting but came through unscathed. He conducted himself so well in the ranks as to win the notice of his officers, and he was taken out of the trenches and sent home for training for a commission. After undergoing the usual training he was gazetted as Second Lieutenant in the Border Regiment and returned to France. His Battalion of the Border Regiment is attached to one of the most famous Divisions in the British Army and Lieutenant Matthews was undoubtedly killed in the recent heavy attacks on the Hindenburg Line. He was home on leave about five weeks ago, and had only been back in France about a month when he met his death. The deceased officer was well-known and respected in Yeovil, and before joining up was a cashier at Parr’s Bank, Dorchester. Widespread sympathy is felt with Alderman and Mrs Matthews and family in the heavy blows they have sustained in the war. This is the third son who has died for King and Country, and two other sons are still serving." The following week the Western Gazette reported "With regard to the death in action of Second Lieutenant Wilfred Matthews, reported last week, Alderman and Mrs Matthews have received the following letter from the Commanding Officer of his Battalion:- “Will you please accept my sincere sympathy, and that of the whole Battalion, in the loss you have sustained by the death in action of your son. He was very gallantly leading his platoon in an attack, when he was instantaneously killed by a machine gun bullet. He had previously performed very good work, and proved himself a fearless and most resourceful leader, so that his loss is keenly felt by his Company and by the whole Battalion. I hope that the knowledge that your son met his death whilst carrying out his duty at the head of his men in an attack on the enemy - literally dying for his country - can prove some consolation to you in your bereavement.” The deceased officer leaves a young widow who is the fourth daughter of Mr and Mrs R Bicknell, Allingham House, with whom the deepest sympathy is felt." 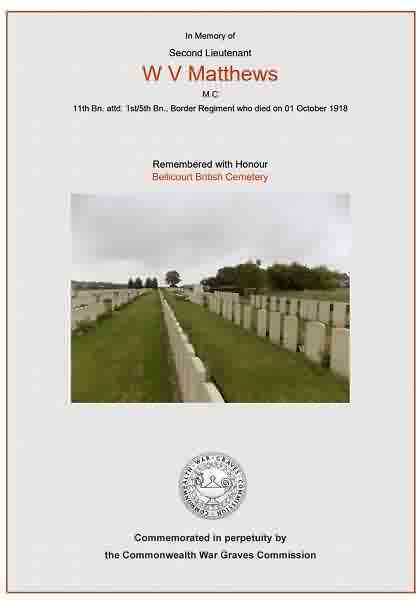 Wilfred Vernon Matthews was interred at Bellicourt British Cemetery, Aisne, France, Grave VI.R.2. His name is recorded on the War Memorial in the Borough. Wilfred lost two brothers in the war - Thomas Percy, known as Percy, and Arthur Donald Taylor, known as Donald. The Commonwealth War Graves Commission certificate in memory of Wilfred Vernon Matthews.